A Velocity of Being is a difficult book to review. How do you review letters to children from various people, accompanied by illustrations by numerous artists? Instead, I think I'll just mention a few of the works that hit home with me. Maria Popova and Claudia Bedrick did an excellent job compiling this work, and providing a brief synopsis of every contributor. There's a reason I said every contributor. These aren't authors who have written to young people, although there are a few authors. There are people from every walk of life who have written to young people, telling them why reading is so important. However, they phrase reading as an adventure, or talk about how it changed their lives. Each letter is accompanied by artwork by an artist or illustrator, people from all around the world. The contributors, both writers and illustrators, offer diversity that is now important to see represented. Shonda Rimes writes about being alone when she was in middle school. However, "If you read a book, you are never alone...Inside that book, you have friends waiting for you. Inside that book is sanctuary." The late poet Mary Oliver makes a promise to readers. "To write is delight, to read is to plant the seed of endless excitement. I promise you." Lena Dunham writes to girls, saying don't put books down. Read with a flashlight in bed. Read at the dinner table. And, say, "I have plenty of friends inside this book." Benjamin Chaud's illustration to accompany Tim Ferris' letter about the book, Fishes of the World, is creative and imaginative. There are scientists, poets, writers, teachers, entrepreneurs in the book. A Velocity of Being really can't be reviewed. It's not a book to be read straight through. It's one to pick up, read a letter or two, and remember your own past. Will young readers really be attracted to this book? Probably not. But, adults who pick it up might be more willing to encourage a child to dive into a book. 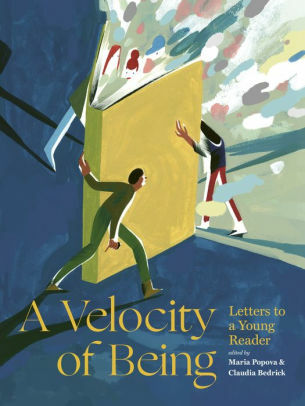 A Velocity of Being: Letters to a Young Reader edited by Maria Popova and Claudia Bedrick. Enchanted Lion Books, ISBN 9781592702282 (hardcover). All proceeds from the sale of this book will benefit the New York public library system.